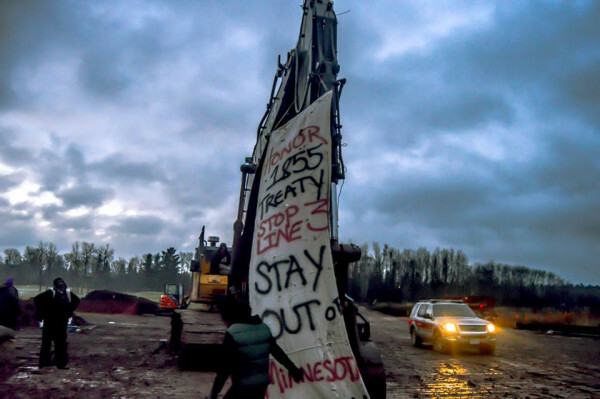 Early Wednesday morning, Water Protectors from the Makwa Initiative halted the last piece of construction for the Wisconsin section of Enbridge’s proposed Line 3 pipeline project. Two water protectors locked themselves to construction equipment halting work at the site. Police arrived approximately 15minutes after the lockdown began. At this time there are 2 Water Protectors known to be under arrest in Superior, WI and 2 Water Protectors still locked onto machinery. The project is estimated to carry almost one million barrels of tar sands oil from Alberta, Canada to Superior, Wisconsin; Enbridge has received approval in Wisconsin, but has not received approval in Minnesota, which would be the largest segment of the proposed project. 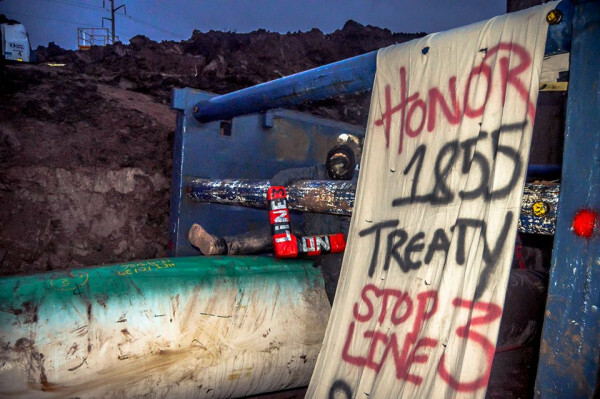 The non-violent direct action came after evidentiary hearings in Minnesota, where Enbridge revealed that it had already paid for 100% of the pipe for the project, and has built several pipe storage yards across the state. This is the kind of direct action that’s required to slow down the corporate capitalist planet-killing juggernaut. Non-violent civil disobedience on a massive monumental scale is the sole practical means of reversing the corporate coup d’état and taking power into the hands of workers. End inequality! End the oligarchy! Socialism now!